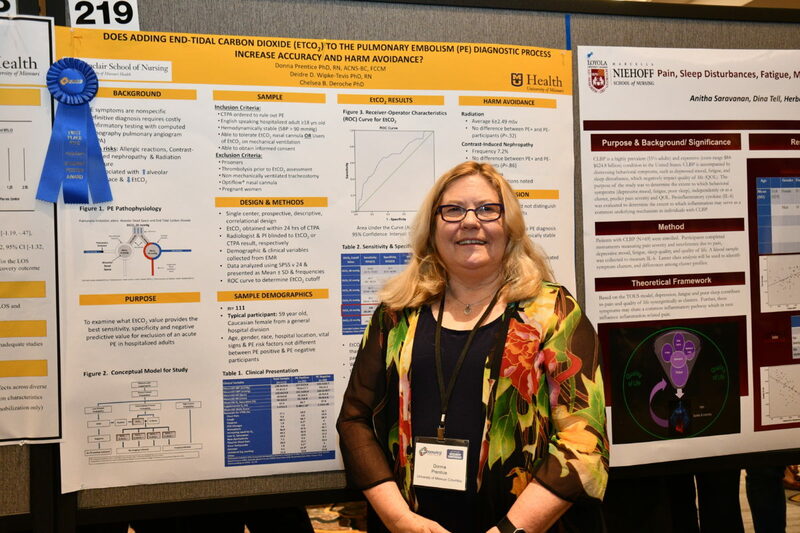 The Midwest Nursing Research Society (MNRS) held its 43rd Annual Research Conference in Kansas City, Missouri on March 27-30, 2019. The theme for the 2019 conference was “Nursing Research at the Forefront of Healthcare Crises”. A premier nursing research society, the mission of MNRS is to advance science, transform practice and enhance careers through a network of scholars. As one of the co-host schools for the conference, the Sinclair School of Nursing played a big part in making the conference a success. SSON graduate students, postdoctoral fellows, alumni, and faculty gave more than 30 research presentations at the conference and three will received awards! Specifically, Dr. Yuanlu Sun received the Dissertation Award from the Self-Care Research Interest Group (RIG); Dr. Donna Prentice received the Graduate Student Award from the Acute & Critical Care Across the Lifespan RIG, and Dr. Kimberly Powell received the Dissertation Award from the Health Systems, Policy and Informatics RIG. Moreover, our faculty, alumni and students were actively involved in the organization of the event. For example, Drs. Maithe Enriquez and Deidre Wipke-Tevis were on the MNRS Local Planning Committee. Professor Emeritus Vicki Conn PhD, RN is the editor of the society’s journal—Western Journal of Nursing Research. PhD alumna, Dr. Briana Snyder, is co-chairing the Emerging Scholars Network (ESN), a collaborative network of students, postdoctoral fellows, and early career nursing professionals that connects scholars at different levels of study and provides expanded opportunities for engagement and leadership within MNRS. Additionally, PhD candidate, Jennifer O’Connor, is currently the treasurer of the ESN. The Alpha Iota chapter of Sigma Theta Tau International Nursing Honor Society, affiliated with SSON, was one of the sponsors for Emerging Scholars Network Lunch & Learn which focused on “Career Planning for Doctorally-Prepared Nurses”. Additionally, to celebrate our research successes and introduce our new Dean, Dr. Sarah Thompson, the SSON hosted a reception for our students, postdoctoral fellows, faculty, and alumni who attended the conference.